Altyre Sawmill LLP is a small independent sawmill on a long-established estate just outside Forres in Moray. We specialise in cutting and supplying locally sourced timber, with a special focus on European Larch, although we also utilise Scots Pine and Douglas Fir. We cut and supply fencing material including; square fence posts, round fence posts, strainers and turners, and fencing rails of all sizes. These are available in untreated larch or treated timber using our pressure treatment tannalising plant. Specialist timbers for cladding or construction works can be produced up to 6.1m in length. We are presently expanding our hardwood timber supply using a variety of hardwoods sourced from Altyre Estate itself. These are ideal for furniture or craft purposes. 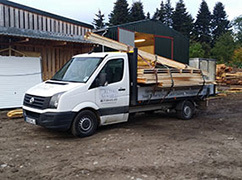 Through our recent purchase of a local timber buildings company, we also now have the facility to construct anything from sheds to garages, summer houses to field shelters. Each of these is designed and built to your requirements and therefore no two are the same. For the garden, we cut and supply sleepers for raised beds, as well as tree stakes and edging boards.